The DECaPS survey is accessible in an interactive viewer developed for the DECam Legacy Survey. The viewer allows any part of the footprint to be immediately inspected and compared with WISE imaging or catalogs from Gaia DR1 or Tycho-2. Custom catalogs may also be uploaded to the viewer. Browse the DECaPS imaging at the DECam Legacy Survey Viewer! DECaPS zrg imaging is used for the RGB channels of the images in the viewer; the i and Y channels are not accessible in the viewer. Full raw and processed images are available through the NOAO Archive. A color-preserving stretch is used to preserve detail in faint regions while not saturating bright regions. Coadded images are made for the viewer by projecting individual images in each band onto a common frame and summing the result. 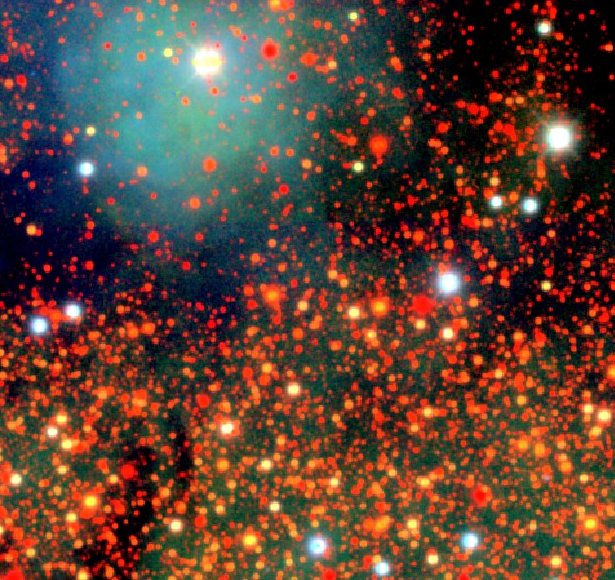 Processed images from the NOAO Community Pipeline are used, and additionally a constant per-CCD sky has been removed before summation. In regions with spatially extended emission on the scale of a CCD (roughly 10'), this process will subtract off continuum emission and lead to artifacts in the viewer. These do not corrupt the underlying catalog photometry, however, since a much finer sky subtraction is performed in the catalog construction; the per-CCD sky subtraction performed here was intended to preserve as much of the diffuse nebulosity as possible for display. Model images can also be browsed in the viewer. These images are constructed from the DECaPS catalog and smooth sky fits for each individual CCD, and then processed in exactly the same way as the observed images. Comparison between the observed and model images can give a sense as to how accurate the DECaPS catalog is in any part of the sky.